With food and water scarce in many parts of Africa, many species migrate long-distances in order to survive. A new study published in the journal, Oryx has found a new record-breaker for the continent’s longest tracked terrestrial migration: a huge group of zebras that traveled a total distance of 500 kilometers (300 miles). The journey took place between the Chobe River in Namibia and Nxai Pan National Park in Botswana, and was monitored by researchers from the Worldwide Fund for Nature (WWF), Namibia’s Ministry of Environment and Tourism (MET), Elephants Without Borders (EWB), and Botswana’s Department of Wildlife and National Parks. The team placed GPS collars on eight adult plains zebras (Equus quagga), a widespread species known to travel great distances, and followed their journey over two years. A plains zebras (Equus quagga) in Ngorongoro Crater in Tanzania. Photo by Muhammad Mahdi Karim. The researchers attribute the length of the migration in part to the fact that it took place entirely within the Kavango Zambezi Transfrontier Conservation Area (KAZA) the world’s largest multi-country protected area. In many other places in the world, animal migrations are hindered by artificial barriers. In a process called “ecological meltdown,” studies have found that fences and other barriers effectively convert wildlife habitat to islands, and can result in population declines due to inbreeding and food shortages. Many of Africa’s other mammal species are famous for their migrations. Wildebeest (genus Connochaetes) migrate in huge herds of thousands of individuals, following the rain north into Angola and Kenya. African elephants (genus Loxodonta wander widely in search of the 450 kilograms (1000 pounds) of foliage they may eat in a single day. 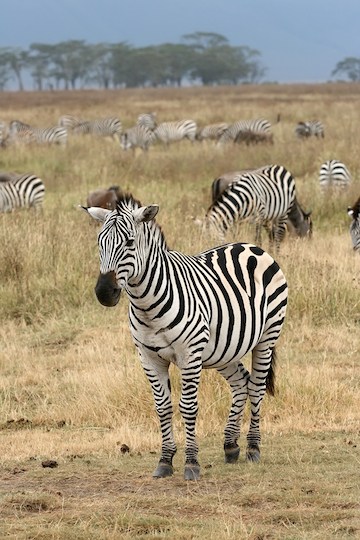 While zebras are known to travel great distances, just how great was not known until now. “This unexpected discovery of endurance in an age dominated by humans, where we think we know most everything about the natural world, underscores the importance of continued science and research for conservation” said Dr. Robin Naidoo, senior conservation scientist at WWF and lead author of the study. Whether this migration represents a fixed route or was a one-time trip is still unknown. The researchers state the need for continued, long-term monitoring of the herd, as well as increased attention for other wildlife assessment projects. Researchers collar the zebras tracked for the study. The Kavango Zambezi Transfrontier Conservation Area (KAZA) is the world’s largest multi-country conservation area. 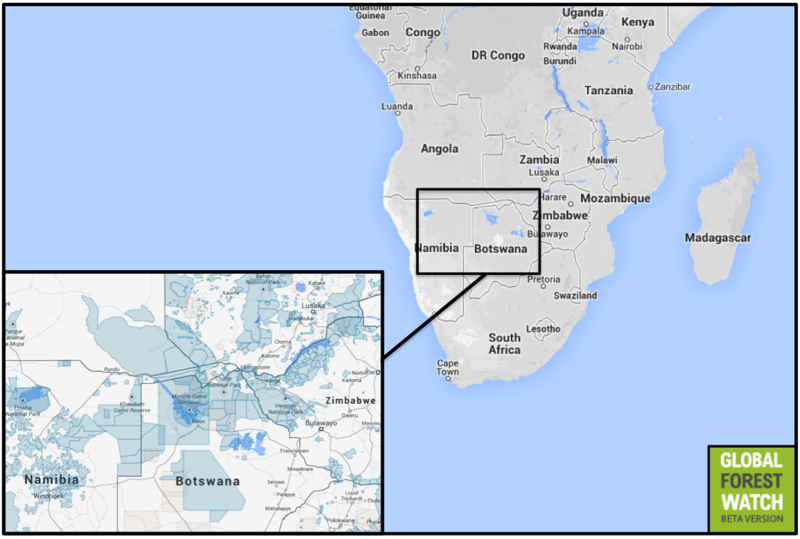 It spans 109 million acres across Namibia, Botswana, Zimbabwe, Zambia, and Angola (protected areas are in blue). Map courtesy of Global Forest Watch. (05/29/2014) After years of discovering new species and setting up protected areas, Neil Burgesses’ career changed. 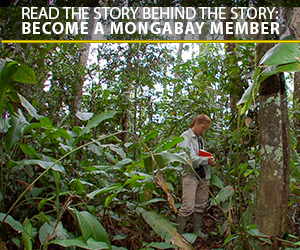 Currently he is focused on community-driven conservation and on how to improve protected areas in Africa’s Eastern Arc mountains region. Neil Burgess has worked in the conservation field for over twenty years, mainly in Tanzania where he also lived for five years. (05/22/2014) Dr. Christopher Golden is an explorer on a mission. As both an epidemiologist and ecologist, he is investigating and expanding the interface between human and ecosystem health. This year, Golden was appointed the Director of Wildlife Conservation Society’s HEAL (Health & Ecosystems: Analysis of Linkages) Program. (05/22/2014) The Democratic Republic of Congo is seeking a billion dollars for a plan to protect up to 9 million hectares of rainforests, reports the Financial Times. (05/20/2014) A recent study describes a new population of chimpanzees, which forms a continuous cultural group inhabiting an area of at least 50,000 square kilometers (19,000 square miles). The population, estimated to consist of many thousands of individuals, shares a unique set of learned skills that are passed on from generation to generation.